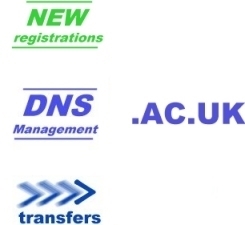 We have registered and managed .ac.uk domains for over ten years for many academic establishments. During the last 20 years Janet have been responsible for the continued high credibility and trust of .ac.uk domains by diligently policing new registrations and renewals. This has meant all .ac.uk domain names are respected worldwide. Register your new .ac.uk domain. The domain extension is trusted worldwide, but why? This domain extension has NEVER been allowed to be abused. Each new application is carefully scrutinised by the naming committee, only eligible academic establishments are accepted. Ac.uk domain names have Worldwide credibility as new registrations and renewals are vigorously checked. On the wikipedia website it states: ".ac.uk domains are intended for the use of higher education institutions...". This is strictly incorrect as ONLY eligible-education-establishments are accepted, which is true for new registrations and renewals. The policing of the credibility falls to Janet who reject new applications and renewals where the establishment fails the eligibility rules. This correct and diligent policing will ensure the credibility and trust of .ac.uk domain names continues well into the future. If you are an academic establishment funded by the UK Government then you should be using a .ac.uk domain name. Never accept a lesser domain extension for a valuable academic establishment. Find out why your education institution should use a .AC.UK domain. ACHost.UK is owned and managed by Seiretto Ltd.